The intro to Crackdown starts pretty simply as the narrator who is also the director of the agency who you also work for opens the cinematic. The opening cinematic explains that there are three gangs who operate in pacific city. The three gangs are the Los Muertos who control La Mugre, the Volk who control the Den and the Shai Gen corporation who operate the Corridor. The narrator mentions that it is your mission to rid the city of these gangs by any means necessary with any weapon and vehicle you wish to use. We see that the character we play as is also a genetically enhanced agent engineered to fight crime. In my opinion the intro is very simple but also descriptive and detailed which i like. By the first minute we know what we as the player are dealing with and we know who we are going after. the Los Muertos. One of the three gangs that operate in Pacific City. The plot of the game starts with you playing as an agent who works for the agency. An international police force dedicated to fighting crime. Your task is to find and kill every gang that operates in Pacific City. These include the Los Muertos who are the equivalent of an 80s or 90s Colombian drug cartel. The Volk who are a communist inspired group who operate a large weapons and smuggling operation in the Den which is the docks area of Pacific City and the Shai Gen Corporation who are this Chinese inspired group who operate the Corridor which is also the hardest difficulty area in the game. This group is particularly difficult as they operate a security and enforcement unit throughout the Corridor and large logistical operations which support its structure and is quite large. In my opinion i like the look and inspiration of the gangs and enemies in the game as it references several cultural and crime groups from the past and present. I like how the story line works as it proceeds from an easy area to eventually a hard difficulty area where the player can build his/her performance to a point where they can take on everything that the enemies and gangs have to offer. 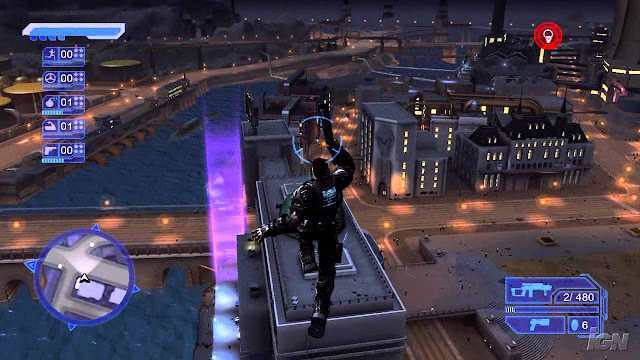 Gameplay of Crackdown showing the HUD,weapons,mini map,health bar and game background. 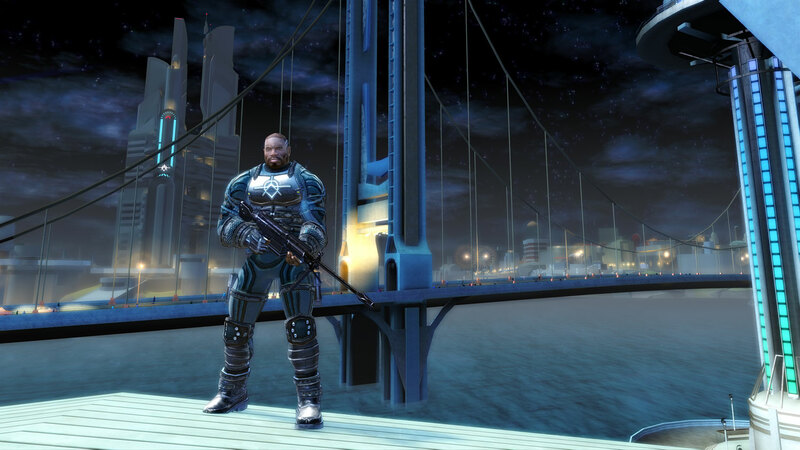 The gameplay and controls handle pretty well in crackdown. The character moves with great speed and pace when you upgrade your stamina ability. There are five tiers to upgrade throughout the game. These five tiers are driving,stamina,explosives,strength and guns. Throughout the game the player can collect objects called orbs which increase all of these skills. These orbs come in several different types from driving orbs which move to stamina and gun orbs which are stationary. The orbs are scattered all throughout Pacific City where the player must go from the tallest building roof to the lowest streets and under bridges to get them all. Apart from orbs to collect there are also gang members and gang bosses to find and kill throughout Pacific City. These gang bosses range in difficulty based on their health levels and how hard they are to kill. The controls are also easy to figure out and can easily be changed in settings on the main menu. The mini map is also accurate to show you exactly where you are. The ability to jump very far distances helps greatly when exploring the map,completing missions or looking for collectibles and i believe that this ability alone is a large driving force for the games premise due to its large size. In my opinion the gameplay feels good. Its very responsive and has a fast smooth frame rate. The controls are also easy to understand. 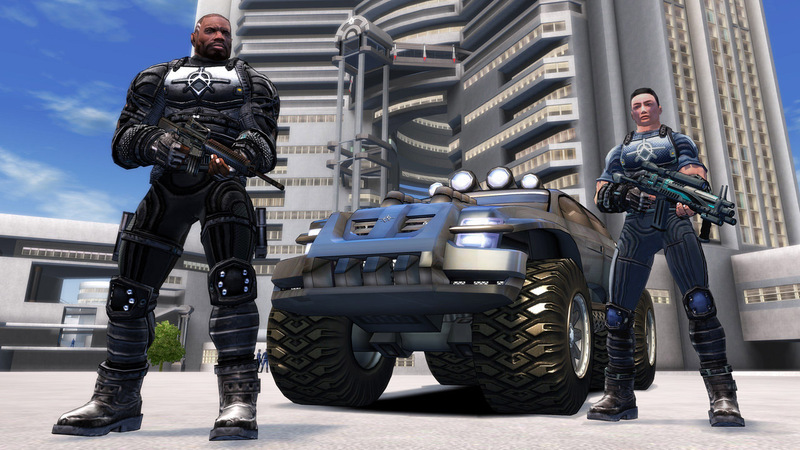 A screenshot of the main character and fellow agent beside the agency suv. The graphics are pretty good considering this game was made in 2007. The textures look good as well as the rendering and colouring looks accurate with soft colors complimenting the greyish coloring in the background. 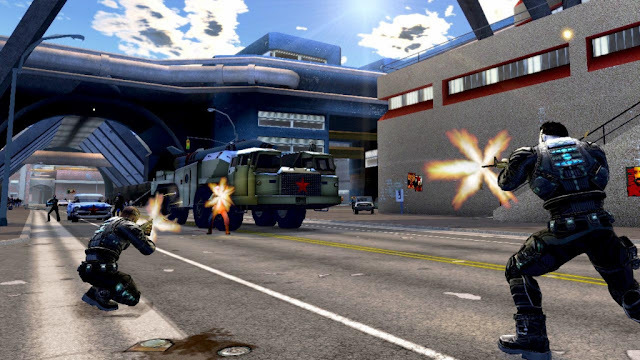 The particular blue used in the game looks quite nice and suits the premise of the game as in the game you play an agent which may be associated with the police and blue is often associated with the police or military force. The outfits are well designed with unique looking fabrics which don't appear to look like anything in real life. The futuristic look of the vehicles as well as the agents clothing looks very appealing when playing the game also. In my opinon the graphic look good for when the game was released. However there is slightly more detail in the main character than the enemies or gang bosses. The vehicles and buildings could also use a touch up regarding the realism. Within the game itself there is no audio apart from when you approach gang members they will shout and warn their comrades. The jumping and crashing noises are accurate and sound real. The only music within the game is when you enter a vehicle. From the radio there is a plethora of songs from A1 people to Toby Mac to Dj Krush and R.E.M. In my opinion the audio of the game is good but could use more game music rather than band or artists songs and if it also had the option to turn on game music while not in a vehicle. A screenshot of an agent with a large bridge g and the agency building known as the keep in the background. 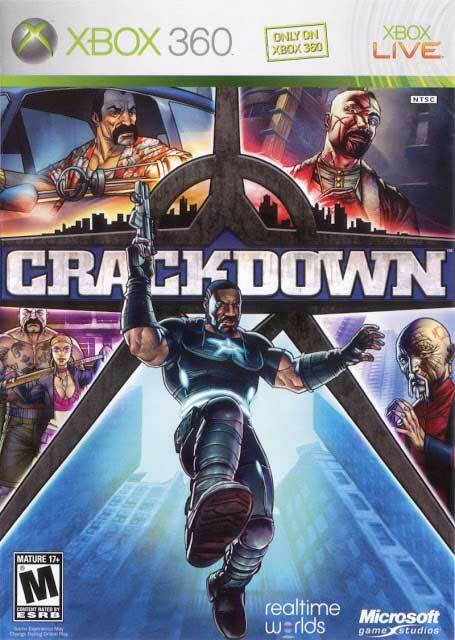 Crackdown as a whole is a cool game to play and look at but there are a few down sides such as no in game music. only music when you enter a car which sometimes makes the game feel lifeless when you play it. The graphics could use touch ups and for a large map there could also be flying vehicles like helicopters and planes to get around easier. The intro is also very quick and there is not much of a tutorial but rather tutorial videos which can be accessed at any time to receive tips on guns,explosives and driving. The pricing of the game is not too bad with the retail price at $15 to $25. The replayability is not as appealing at the campaign becomes boring after you complete the game with no available mission replays and when all the collectibles are obtained. 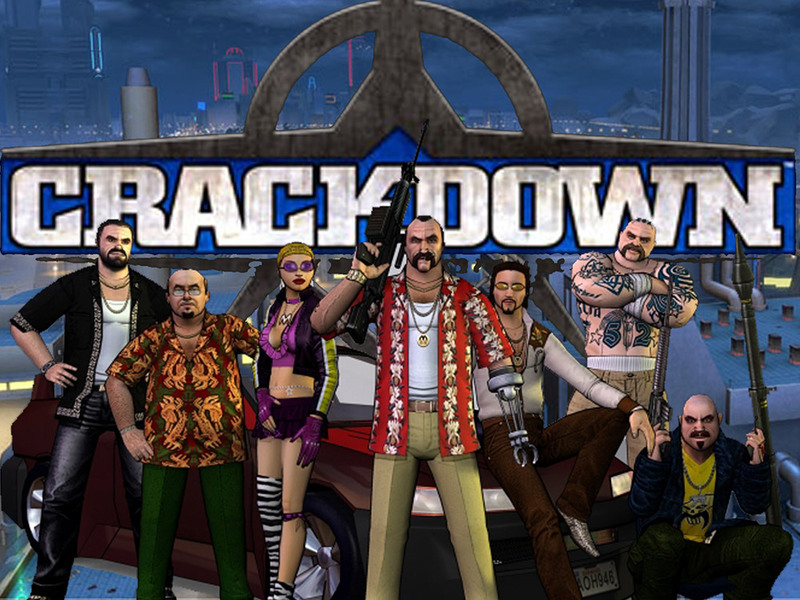 overall i give Crackdown a 7/10.